Fruity and balanced to taste for those what are seeking elegancy and exclusivity. Light and sweet nutty flavours with just a hint of warm tropical fruits. There is a light almond and hazelnut after taste. 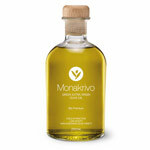 Oli Llopart is a traditional oil obtained directly from the olives and only by mechanical processes. It’s collected at the time of mellowing and extracted from the first cold pressing. Oli Llopart born on November 2012 with the aim to help to preserve some of the autochthonous olives from the catalan country. Oli Llopart appreciates the quality of his product and want to put all the efforts distributing over the world this liquid Gold.